At the risk of sounding self promoting, my post on taking my daughter to Yale was published at The Gospel Coalition and The Aquila Report (the former more broadly yet solidly evangelical, the latter robustly confessional and Presbyterian). And at the risk of feigning modesty, I’m very humbled, encouraged and surprised. Last week, standing beside our van parked in front of her dorm on College Street at Yale University (a Hallmark card moment if there ever was one), it was my fateful turn to say goodbye to our oldest child as she transitions to college. I tried summoning up some words of wisdom, or even something profound to say. It’s not like this moment caught me (an admittedly slow learner) by surprise. “This is it,” I thought, heaving a weary sigh instead of taking a deep manly breath. “Better make this count.” I was ready. So what happened? Is this really all that I could muster? The first of our five precious children transitioning to college (and not just any college, mind you, but [ahem] Yale, which is, in spite of our seemingly pervasive virtual connectedness, a world away from Minneapolis), and I had nothing but a mere “goodbye” and “I love you”? 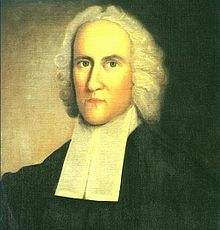 Adding insult to injury, by training and profession I’m a pastor with a deep appreciation for Jonathan Edwards, the namesake of my daughter’s college. One would think loquacious Puritan-laced vocabulary would naturally fall like fresh dew from my lips. But no. One could chalk it up to fatigue due to the long drive, or the many hours spent acquiring things for her dorm room, or simply the trauma that comes with letting go (or trying to let go) of my first child as she embarks on this next biggish step in her life. But I had no words. And then, hours later while emotionally torturing myself, I remembered. I believe that the whole universe, heaven and earth, air and seas,…be full of images of divine things, as full as a language is of words; and that the multitude of those things that I have mentioned are but a very small part of what is really intended to be signified and typified by these things: but that there is room for persons to be learning more and more of this language and seeing more of that which is declared in it to the end of the world without discovering all. Recently, my oldest daughter was informed which college she’ll attend while at Yale. This is the place she’ll live, eat, go to the library, form most of her friendships, etc., so this is no small news. Modeled after Oxford and Cambridge, Yale has 12 colleges. Purportedly, incoming freshman are chosen a specific college at random. So where did my daughter get assigned? Jonathan Edwards College. On the whole, I have great admiration for the Puritans and Jonathan Edwards (a well known 18th century pastor and theologian) so I’m giddy with excitement regarding my daughter’s assignment. Seriously, I almost wet myself when she told me the news. Good thing there was a bathroom nearby. Yale publishes The Works of Jonathan Edwards, an exhaustive (and expensive) multi-volume set. Yale also is home to the Jonathan Edwards Center, the one place to go for research, education, and publication on all things Edwards. There’s no shortage of Edwards material to read, but if you’re looking for a place to begin on a very general level, I highly commend three accessible books. The first book is A Short Life of Jonathan Edwards, by Notre Dame historian George Marsden. The title, rather than referring to his life span or height, instead is a slim volume (especially in comparison to Marsden’s magisterial Jonathan Edwards: A Life), providing a helpful snapshot of Edwards. Start here. The second book is A Jonathan Edwards Reader (various editors). It covers a variety of material from his sermons, letters, metaphysical works, and other topics. The final book is The Sermons of Jonathan Edwards: A Reader (various editors), providing ample breadth of Edwards’ preaching (which is far from arid or erudite). If you view Edwards as a wig-wearing, joyless, scowl-faced man who wore dull-colored clothing and primarily understood God as vengeful and violently vindicative of humanity (i.e. his sermon “Sinners in the Hand of an Angry God”–these books are especially for you. Read them, if only to get a better sense of Edwards’ significant historical influence on the United States. Yes, he was a deeply religious man, and he was not without his blemishes. Who is? But he was a great man, and a towering intellectual. (Deeply religious and intellectual? Scandalous!) Yale wouldn’t be Yale without him, let alone the United States. Find out why and read these books.